I've dipped my fingers into the made for TV Lifetime cinematic universe and reemerged with a tale of what happens when you push Shannon Daugherty to her mental limit. The answer? A single emotional girl debating a career change (aka any College Girl USA). Its about to get real in here, so strap in. Once upon a time, roughly mid-90s, there was a princess of a sorority named Shannen Doherty. Born of pasty white cheekbones, raven hair and a kickin' band where she dates one of the London twins (Jeremy I want to say) who also plays the bass (they always do). She unknowingly has a blonde psychotic stalker who has done everything in her power to infiltrate Shannen's life and then ruin it. Had Shannen been paying attention, she would have remembered that talent show she competed in when she was seven and beat out that girl as well as everyone else. Since she didn't keep tabs on it, her life is about to get amazingly complicated. From there, Blonde Stalker (didn't bother to remember her name) sneakily joins Shannen's band, turns Shannen's sorority friends against her, gets her kicked out of the band and seduces Shannen's boyfriend. Espescially this girl. This girl who's name I don't remember. Not that it matters because her whole goal in this movie is to Single White Female Shannen Doherty. We've all been there. Look at how much she cares. She just wants all things for all people. Here's the thing - and this is a Lifetime Cinematic Universe rule. Pretty white girls get stalkers. If you make a new friend and things are really going good - she's probably planning your murder . 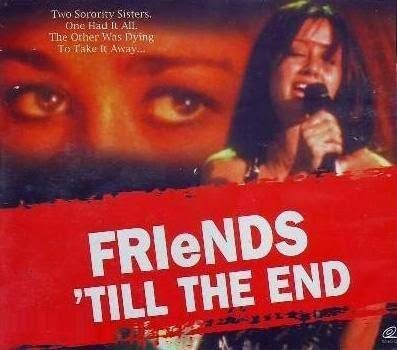 The one thing you should know about this movie is that Shannen Doherty sings. She sings a lot. She has a band and she wears tiny 90s dresses. Some of them have fruit. Some are made of crushed velvet. All of them took me back to a simpler time when we all thought that was okay. I know what you're thinking - but does she have chunky Mary Janes on? Rest easy, gentle reader. She does. I'll say this...should you watch this movie, which you absolutely should (its on YouTube...for FREE), there's some catchy songs. Like hummable, stuck in your head songs. And had this been the year 1997, I would have gotten the gumption to walk to WalMart or order the Friends Til the End Band's (not their real name) from BMG as part of my 12 CDs for one cent offer. Sadly, its 2014 and none of those words make sense and I'm forced to move on with my life anyway. 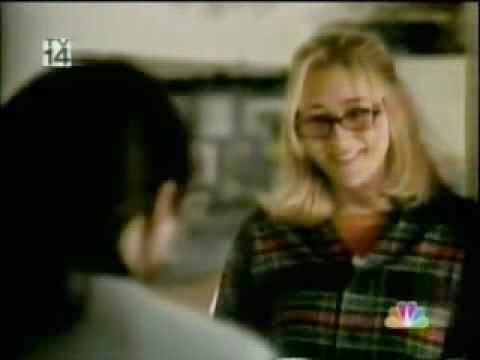 Had things been a little bit different, Apple would have been sneakily putting the Shannen Doherty Experience (again, not the band's real name) into our iTunes without asking and Bono would've been hosting Scare Tactics or doing commercials for Education Connection. Some movies get college life and some just don't. Maybe my college experience was unusual, but so many things that happened in this movie I had no recollection of. For example, the women in the sorority house were just genuinely NICE. It started to feel a little bit more like home when Blonde Stalker overheard Brittany telling Shannen a secret and totally told everyone behind Brittany's back that Brittany was super super fake and then Blondie blamed Shannen and everyone totally believed it. Brittany totally thought she was pregnant by the way but it turns out she just can't do math. Which is a far more dangerous rumor. Then again, I may have had a different college experience than most. Blonde Stalker knows Rule #1 of gaining your sympathy back - when confronted with something you may or may not have done (ie spilled a friend's confidential secret, gotten caught going through your personal stuff, killed a guy in an alley) start to act like you are in deep deep pain - either physical or emotional. Its girl catnip. Shannen processes new information onscreen like no one else in the business. "Shannen, you just learned that your career won't skyrocket due to badmouthing everyone on Charmed. You're reaction?" In case you weren't sure, Shannen Doherty is pure and blameless. She deserved none of this. See how she flourished in a nest of loving nurturement? You'd think that but then take into account she brought Blonde Stalker friend home, the friend who had no family and then rubbed her face in it. Blonde Stalker is truly in her element behind a mic and just singing her heart out. Which makes one wonder - if she had just gotten to this point, embraced the friendship and made room for a Shannen, things would be so much different. For example we might all be downloading that one really catchy song of theirs from iTunes. Which I'm not going to lie. This was my face for the whole movie. I still can't find it on Netflix so can you please tell me where to find it. Fail!! This YouTube account has been removed for infringement of something or the other. Life sux. Best Lifetime movie ever. I love it so much. I ordered it off a random site on the internet so either 1. I'll get the movie soon and my life will be made or 2. I won't and I won't be surprised, but either way 3. my identity will stolen. Good luck with that!